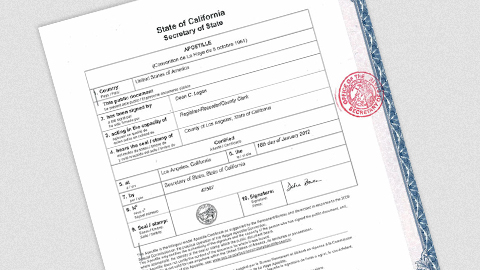 Process Server Sacramento County can obtain a California Apostille Serices Authentications for your birth Certificate, notorized document, notarized transcript, or legal document. Since we are located in Sacramento, we make every effort to submit your documents to the California Secretary of State the same day we receive it. The Secretary of State will take an average of 1 business days to Apostille or authentication most documents that are delivered in person for international use in accordance with the Hague Convention. Can I get an Apostille for a territory within the United States, e.g. Puerto Rico? No. Apostille Services California can only be issued for documents to be used outside the United States of America. Accordingly, we do not issue Apostilles for Puerto Rico, Guam, United States Virgin Islands, Northern Mariana Islands, American Samoa, or any other American territories or possessions. Generally, the notarial act is sufficient for use in any American territory or possession.